Print as many as you need at home. 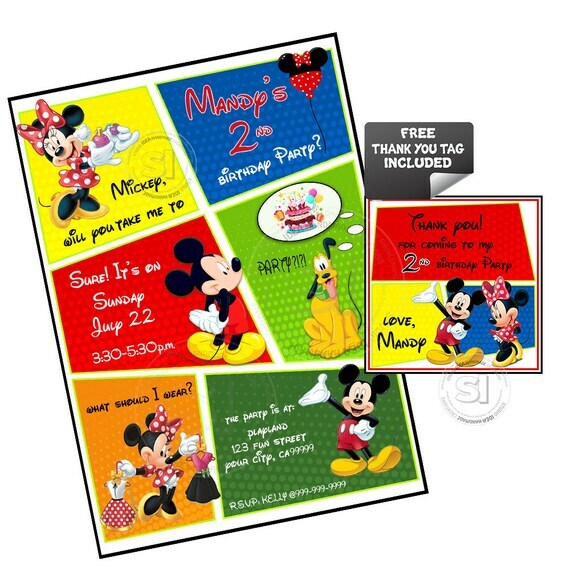 Available invitation size: 4"x6" and 5"x7"
File will be sent to your email address on your etsy account within 24-48 hours after your purchase is complete. ********Please note that there can be no order cancellation after your pdf file has been sent to you. Be sure to print on cardstock, photo paper or a heavy weight paper for optimal quality. ***Colors and fonts can be altered at request. Please be aware that all computer monitors and printers are calibrated differently. This means that slight color shade variations may occur from your screen to the print out which is to be expected. The characters and images used are free and not being sold. What you are being charged for is the time it takes me to create and personalize each design. This item is not a licensed product: all character images used are free and not being sold. We DO NOT SELL or claim ownership over the character clipart or graphics, they belong to their respective copyright holders. There will be no copyright release from us, so please make sure the printing company you'll be using doesn't need any of this. Not all photo labs are aware of this policy and if you have issues with a photo lab refusing to print for you, please try another local photo lab or print at home yourself. Thank you for visiting Studio IDEA!